A longtime cruising couple decides to downsize from their 43-footer, but what boat might fit the bill? I’ll never forget the moment when the disturbing thoughts entered my mind: Are we having as much fun as we used to? And, I feel like doing something else this weekend. Not to mention, Boy, that bill from the boatyard this year was a whopper. My wife, Stacey, and I had dropped anchor for the weekend in one of our favorite gunkholes, just 25 miles from our home in Annapolis, Md. We were aboard our Thomas Point 43, Sawdust, a custom Down East-style boat we had built 10 years ago. 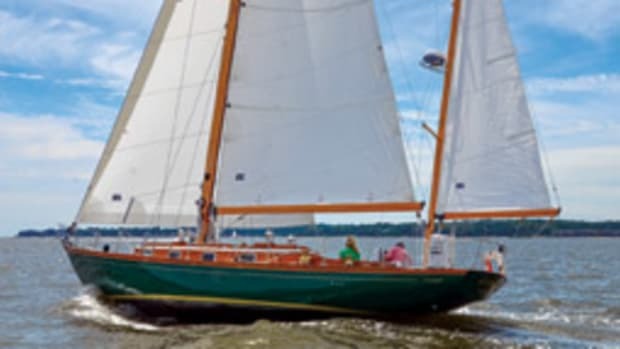 She had served us well, taking our family for an unforgettable one-year adventure on the Great Loop, as well as numerous cruises from Maine to the Bahamas, not to mention extensive explorations of Chesapeake Bay. But something felt different this weekend. Our son was away at college, and his stateroom, where he did his homework when we cruised full time, was empty. Sawdust’s office space — once filled with buzzing satellite receivers, chirping cell phones, a cranky server, a 12-volt fax machine and Toughbook computers — now was a place to stow my cameras, lenses, tripods and a laptop, the tools of my new career as a boating photojournalist. The deep freezer where we had kept enough frozen food for a three-month stay in the Bahamas was empty and turned off. And our fishing rods and tackle boxes were sitting idle, in need of a good cleaning and reorganization. Sawdust itself was in Bristol condition. She had recently undergone a series of upgrades, including an extension of the cockpit roof with side curtains, the addition of solar panels with an auxiliary charging system (making her able to sit on the hook almost indefinitely) and a simple but effective rainwater-catching system. A brand-new RIB tender with a 4-stroke outboard was stowed on the swim platform, ready for easy launching using our new davit system. Her brightwork sparkled with four new coats of varnish, and we recently had our decks and topsides refinished with Awlgrip. Even the transom teak, which never was quite perfect in my mind, had been replaced and finished with 12 coats of varnish. There wasn’t much to do other than go cruising. But as we sat in the cockpit enjoying the summer breeze and beautiful view, I wondered whether I had enough courage to broach the subject with Stacey. Would I be sorry later for even mentioning what was on my mind? If I let the genie out of the bottle, could I get it back? The ice was broken and we spent that entire weekend talking about our boating experiences — past, present and future. I certainly had more of an emotional attachment to Sawdust, having invested an inordinate amount of time working with the naval architect and builder during its design and construction. Except for major mechanical or cosmetic work, I took care of maintaining her and was intimately familiar with her every nook and cranny. I also spared no expense keeping her shipshape. So it was hard for me to think of the unimaginable — selling Sawdust. Although Stacey is an avid boater who loves cruising, she had a more pragmatic point of view. 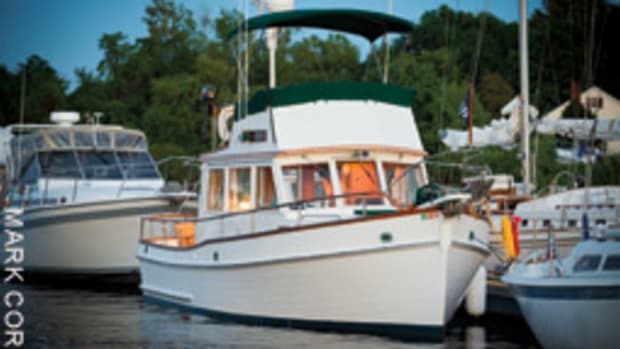 “How much are we using her, compared to how much of our income do we spend to maintain her?” I tried never to think about the cost-versus-use ratio because that kind of objective, rational thinking can be dangerous to the health of the entire boating industry, and I was now making a living working in it. After running an ad agency for nearly 30 years I was enjoying a new career as a freelance marine photojournalist. Magazine assignments had me traveling from coast to coast and beyond, often on luxurious yachts and in the company of fascinating owners. 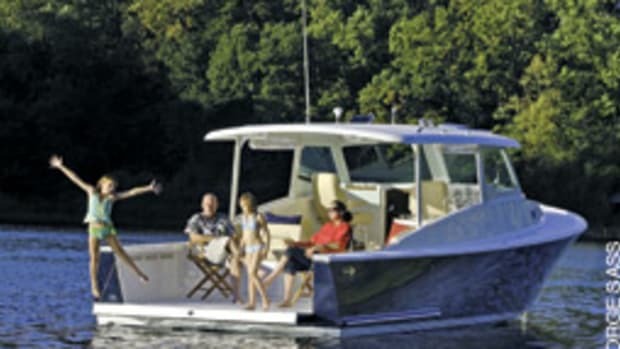 When I wasn’t writing about cruising destinations, I was testing and reviewing new boats and products. My passion had become my profession and I was now spending more time on other people’s boats than on my own. Stacey had taught public high school for nearly 25 years, and before the worldwide financial meltdown she was considering retirement. But as happened to so many of us, the “new reality” had her rethink her retirement plans. Her decision to stay was a good one, as she was promoted to department head. But this position required a new commitment, and our plans to resume full-time cruising were delayed a few more years. Cruising had been a major focus of our lives for the nearly 25 years that we’d been married. But the double whammy of sky-high fuel prices in the summer of 2008, followed by the financial crisis, kept us closer to home during the last couple of years. Instead of our planned summer trips down the Intracoastal Waterway and winter vacations in the Bahamas, we spent weekends on the Chesapeake. During this time we discovered a new interest that began to compete with our time on the water. For a very small investment (less than our recent boatyard bill), we bought a new 14-foot lightweight travel trailer that our Jeep Wrangler or Honda pickup could tow. Admittedly, it was a spontaneous purchase, but both us of were enthusiastic about trying something new. We began with short trips close to home, but soon found ourselves camped out on Carolina beaches and the shores of Florida during winter and spring breaks, enjoying the outdoors in much the way we enjoyed cruising. There were huge differences, however. Instead of spending $100 to $150 a night for a 45-foot transient slip at a decent marina, a campsite in a beautiful state park with water, electricity and clean bathhouse facilities costs, on average, only $25. (As a new but reluctant member of the senior citizen group, I often paid half this price.) Secondly, we found the maintenance, insurance and operating costs of land cruising to be a small fraction of what our boating costs were. Our biggest discovery, however, was that we were surprisingly comfortable and satisfied in such a small, simple trailer. We had everything we needed, including a galley with a sink, an LPG cooktop, a microwave and two-way refrigerator; a small flat-screen TV; a music system; a 40,000-Btu gas furnace; a hot-water heater; air conditioning; a shower; a head; a black-water tank and a gray-water tank; and 35 gallons of fresh water. Our dinette converted to a double berth, and there was a swing-down “upper berth” for our son. Outside, a barbecue grill connected to our LPG supply, a rollout awning protected us from the sun and rain, and an external shower helped to keep sand and dirt from our main living area. Everything was simple and easy to maintain. And for us “yachties” the cheap plastic fittings and ugly decor from RVs past had been replaced with decent hardware and tasteful interior furnishings. Best of all, the mobility of this small trailer meant that so many distant places were within a two- or three-day drive. We left Annapolis in the middle of a blizzard last year and were sitting on the beaches of Port St. Joe, Fla., two-and-a-half days later. Our inflatable kayaks gave us the freedom to explore local waters, much the way we would have if we had been on our boat. On our way home we enjoyed waterside campsites in Georgia and South Carolina. We also discovered that by having a much smaller investment in our trailer, we didn’t feel obligated to use it every weekend, as we did with Sawdust. There was a sense of freedom knowing it was sitting in our driveway ready to travel yet at a fraction of the investment and operating cost of our 43-foot yacht. As we sat on Sawdust that weekend and talked about how much we enjoyed land cruising in our small, simple travel trailer, we thought maybe we could take a similar approach with our next boat. We began by listing the key features we would look for in a new, smaller boat with four basic parameters in mind: mobility, simplicity, economy and livability. Good quality and seaworthiness were, of course, the primary qualifiers. At first we thought something between 30 and 35 feet would be ideal, but as we began to look closely at various designs we realized we didn’t want a smaller Sawdust; we wanted a different type of cruising experience. There are many Down East designs in this size range that would look and feel like the boat we had, but would one of these help us accomplish our goal of truly simplifying things and reducing costs? Our search narrowed to smaller, lighter boats with a draft shallow enough to get close to shore or even capable of being beached. We hoped that our two inflatable Aries kayaks would take the place of a dinghy and could be carried on the cabin top while inflated or stowed in their backpacks in the cockpit. We widened our search to include boats as small as 25 feet. 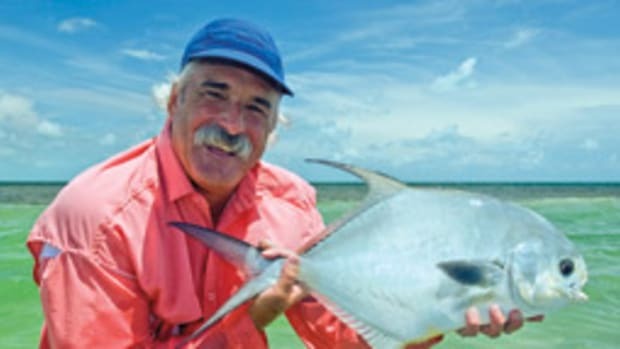 The thought of being able to move our boat over land to our favorite cruising destinations — such as Georgian Bay, Lake Champlain, the Florida Keys and even the Pacific Northwest — was tremendously appealing to us. But we knew that a boat big enough for spending at least a week or two on would be bigger than we could tow, even with our Honda Ridgeline. 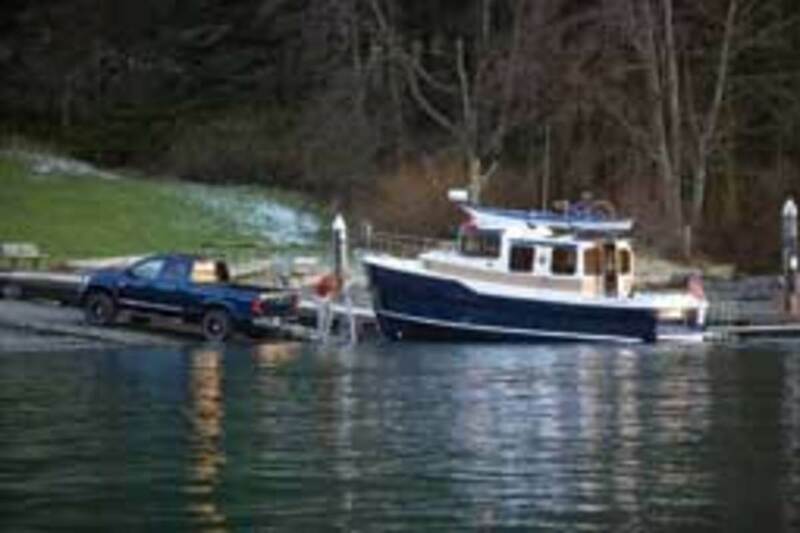 As long as our boat could be economically trucked by an outside transport company with a heavy-duty pickup, preferably on its own trailer, we would have virtually unlimited cruising options. 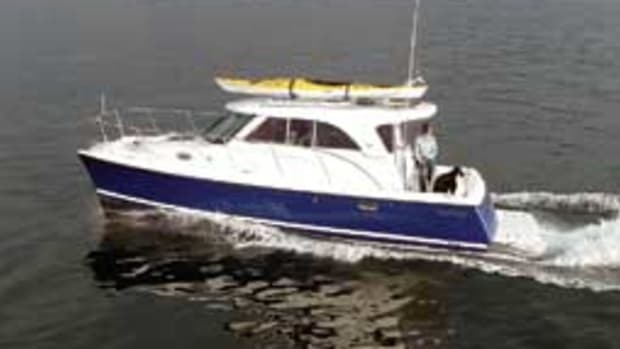 We had become used to cruising at 16 to 18 knots on Sawdust with a fuel efficiency of slightly better than 1 mpg. Knowing our new “pocket cruiser” wouldn’t have the space, comfort and luxuries of Sawdust or trawler-type boats, we wanted something that could get us from anchorage to anchorage in a reasonable amount of time. Cruising between 12 and 14 knots while achieving at least 2 mpg was the minimum speed and efficiency with which we would be satisfied. Anything approaching 20 knots would be a bonus. And being able to comfortably run at displacement speeds while sipping fuel also was important. Although we probably wouldn’t be making the kinds of offshore trips we previously did, we wanted enough tankage to provide a range of at least 250 miles at normal cruising speeds. After owning and operating diesel boats for more than 25 years, I have a good sense of their capabilities and maintenance requirements. On the one hand, a single diesel would provide dependable power and good fuel efficiency, and the newest electronic engines are cleaner and quieter than their predecessors. But on these smaller boats basic maintenance undoubtedly would require me to squeeze into a tight space, something my aging body resists more and more each year. Also, a small boat not only meant that we would be closer to the engine, but also that the vessel’s lighter mass would not be as effective in absorbing noise and vibration. We began to at least consider other alternatives. Our recently repowered Boston Whaler made us a believer in the performance and reliability of modern 4-strokes. These new outboards are quiet, clean, dependable and more economical than ever. Their electronic and mechanical complexity pretty much rule out working on them myself. An authorized dealer would have to take care of most maintenance and service functions, a situation that appeals to me more and more. I also like the idea of being able to raise the engines to explore shallow, hidden anchorages or get close enough to shore to be able to wade in or even beach the boat. The biggest advantage of outboards for me, however, is that they are far aft, outside the main living area and helm station, resulting in a super-quiet ride with minimum vibration. My preliminary research of fuel-burn data with these modern engines indicates I could expect more than 2 mpg at a cruising speed between 16 and 18 knots on a typical 25- to 28-foot hull driven by twins. 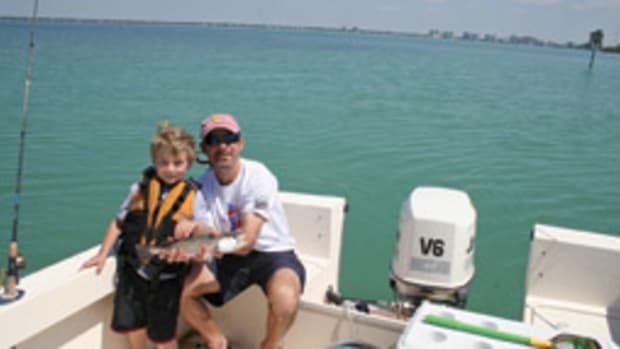 So many outboard boats on the market today are high-performance center console fishing boats, some with a remarkable amount of horsepower. 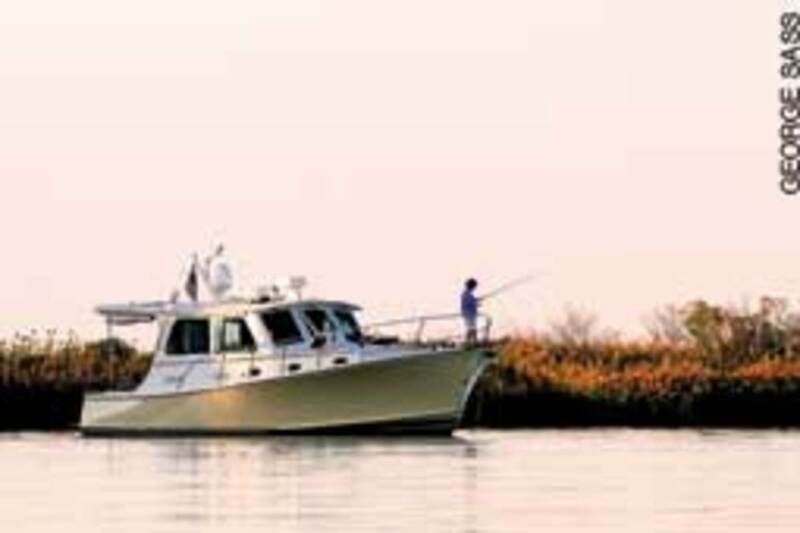 These boats venture far offshore, so the dependability of the outboard power is not an issue. Why more small cruising or trawler-type boats are not being offered with outboard power is a mystery to me. Our experience with our travel trailer has helped establish the basic requirements we would need to spend weeks or even months aboard our new, smaller boat. Knowing we could take periodic breaks by getting a room at an inn or motel while we cruise allows us flexibility. A major reason for our downsizing, of course, is to reduce the overall cost of boating and to put it in better perspective, or balance, with our other interests. We have set a dollar limit of $200,000 that we would invest in either a new or used boat. 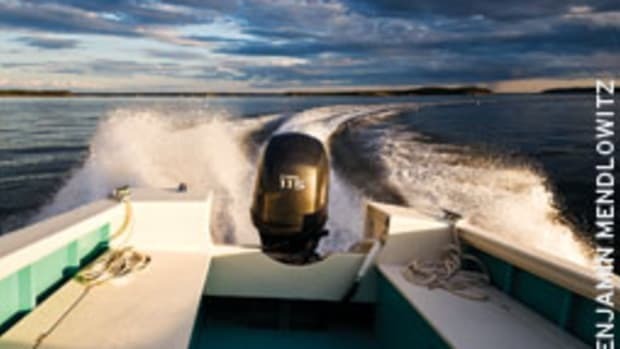 Based on our new size preference of 25 to 29 feet and our interest in outboards, we’re confident we can find our ideal cruiser for quite a bit less. Although I have taken pride in owning boats with generous amounts of beautiful brightwork, I hope spending time or money on varnish work is a thing of the past. I can still admire these works of art, but I no longer wish to own one. I also want to minimize complex electrical and mechanical systems that require expensive service and maintenance. A solar panel or two can keep my batteries charged. I certainly don’t need a generator (Sawdust never had one) and I may not even need an inverter and all the extra wiring that goes with it. I’ll probably upgrade my refrigeration to a 12-volt, keel-cooled Frigoboat unit that has no moving parts and I plan to take advantage of the new reasonably priced multidisplay electronics that are available today. This is an excellent time to be in the market for a new boat. The recession has weeded out the weakest boatbuilders and their mediocre products, leaving the stronger, more stable and often innovative companies to survive and prosper.